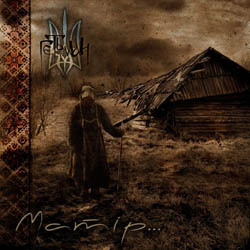 Ukrainian pagan black metallers Гетьман (Hetman) will release their second album “Матiр” via Sublimity Records. The exact date isn’t announced yet, but it will be out the later on February 2014, limited to 125 copies only. “Матiр” is dedicated to the most valuable thing in everyone’s life – his mother. The album consists of eight songs, with big contrasts between them, both in music and in poetic terms. Six of these songs are based on poems of famous Ukrainian writers, whose contribution to Ukrainian literature and culture can not be overstated. It is a musically rich album with “difficult” compositions, that will be appreciated by fans of various styles of “heavy metal”. Total play time is almost one hour and Гетьман have revealed the album tracklist and cover artwork.